Essay on Importance of Reading Newspaper. 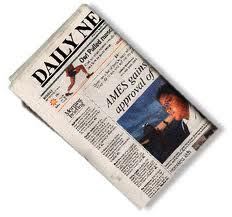 As the name suggests newspapers are a source of news and information. In several respects they are also a medium of communication among the peoples of the world. Today there are hundreds of newspapers all over the world. Everywhere there is a keen desire to learn more and more about the affairs of the world. This is partly the result of the spread of education which sharpens one’s curiosity to learn about distant lands. As a source of news, the newspaper is almost indispensable to those whose thirst for knowledge is insatiable. They contain news on events in distant corners of the earth. Information about such events arrives almost immediately. As a result, people everywhere are informed about the most important event in the world very quickly and almost at the same time. For example, if a war breaks out in one part of the world today, the people in the other parts will certainly come to know about it tomorrow. As a result, all the countries of the world are able to do something quickly to help those who have suffered because of the war or to persuade the countries at war to cease fighting.